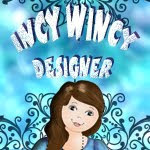 This card I created using the Hippy Chick Digi created over at Sassy's Studio Designs. I had a lot of fun using the gradient tool and a lot of spectrum colours to bring out the groovy look to this card. I put a lot of flower bling on the card and this was really enjoyable to make.